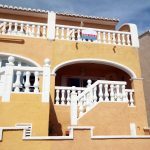 Linked villa for sale in Star Park, Benimeit, Moraira. 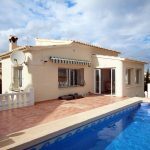 This three bedroom, two bathroom linked villa has the accommodation spread over two levels, situated in a small private gated community with fabulous sea views stretching from Cap d’Or across the bay of Moraira to the Ifach in Calpe. ACCOMMODATION: Entrance Hall, galley kitchen, lounge/dining room, double bedroom, guest bathroom and utility room. UPPER LEVEL: Two double bedrooms, family bathroom. OUTSIDE: Glazed naya with terrace, upper sun balcony, carport, communal pool and sunbathing terrace. From the lower level glazed naya a pathway leads around the side of the villa to the communal pool with sunbathing terrace and to the rear of the property is a lovely communal seating area to enjoy the sunsets and mountain views.